Full Price: $ 15.00 20% off! 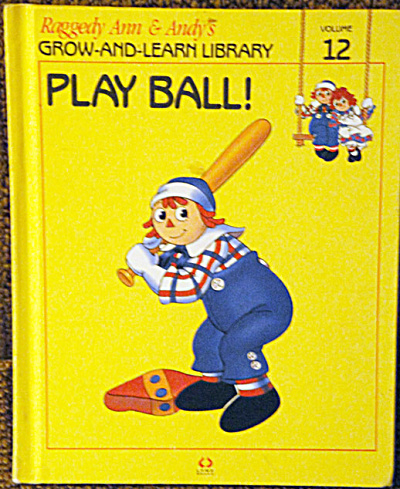 This listing is for the hard cover book, Play Ball!, Volume 12 in Raggedy Ann and Andy's Grow-and-Learn Library. It contains 44 pages with large print and color illustrations on each page. This book was copyrighted by Macmillan, Inc. in 1988, and published by Lynx Books. The characters and drawings are based on the creations of Johnny Gruelle. The book is preowned and gently used. The cover is intact with only minor scrapes on the back. The pages of the book are intact and in excellent condition. The book is in excellent condition. The book is meant for a young child to read, though it is also good to read to a child. Play Ball! is a story about Raggedy Ann and Andy visiting the toys in the playroom of Marcella's cousin, David, where they play baseball with the other toys when the children are away. The book teaches about sportsmanship, competition, and remaining friends despite competion on the ball field. When the people are away the dolls, stuffed animals, and young animals come to life and talk and interact with one another in drawings like classical ones. Its ISBN number is ISBN 10: 1558021124.